Repentance means to let go of what you shouldn’t love, and embrace Whom you should love. You can’t love God and love sin at the same time, nor can you live for Christ and continue to live in sin at the same time. Love God and live, or love sin and die. “Repentance means changing one’s mind, so that one’s views, values, goals, and ways are changed, and one’s whole life is lived differently. Mind and judgment, will and affections, behavior and lifestyle, motives and plans: all are involved. Repenting means starting to live a new life. 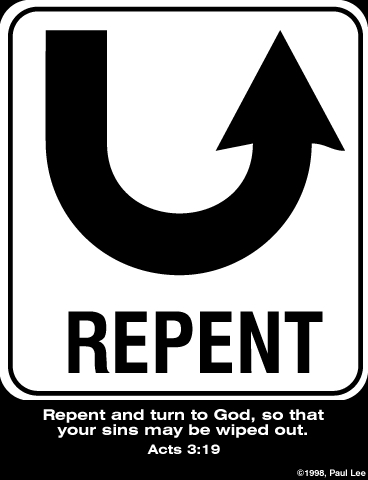 “The call to repent was the fundamental summons in the preaching of John the Baptist (Matthew 3:2), Jesus (Matthew 4:17), the Twelve (Mark 6:12), Peter at Pentecost ( Acts 2:38), Paul to the Gentiles (Acts 17:30; 26:20), and the glorified Christ to five of the seven churches in Asia (Revelation 2:5, 16, 22; 3:3, 19). It was part of Jesus’ summary of the gospel that was to be taken to all the world (Luke 24:47). It corresponds to the constant summons of the Old Testament prophets to Israel to return to the God from whom they had strayed (e.g., Jeremiah 23:22; 25:4, 5; Zechariah 1:3-6). Repentance is always set forth as the path to remission of sins and restoration to God’s favor, while impenitence is the road to ruin (e.g., Luke 13:1-8). “Faith and repentance are themselves fruits of regeneration. But as a practical matter, repentance is inseparable from faith. Turning towards Christ in faith is impossible without turning away from sin in repentance. The idea that there can be saving faith without repentance, and that one can be justified by embracing Christ as Savior while refusing Him as Lord, is a dangerous error. True faith acknowledges Christ as what He is, our God-appointed king as well as our God-given priest, and faith that trusts in Him as Savior will submit to Him as Lord also. To refuse this is to seek justification with an impenitent faith, which is no faith. a sinner, out of the sight and sense, not only of the danger, but also the filthiness and odiousness of his sins, as contrary to the holy nature and righteous law of God, and upon the apprehension of His mercy in Christ to such as are penitent, so grieves for and hates his sins as to turn from them all unto God, purposing and endeavoring to walk with Him in all the ways of His commandments (Westminster Confession, 15.2). Have you this repentance, my friend? If your faith is absent of this repentance, then you do not understand life-saving faith. Please see the link on Eternal Life, or contact me if you’d like to talk about it. Don’t waste your life, and don’t wait until it’s too late – you are not promised tomorrow. Repent and believe the Gospel.